Catering / EventsCatering / Events Happy guests – relaxed hosts: with us, your party is in excellent hands. Reservations / EnquiriesBooking / Enquiries We are all ear for your questions and wishes. Experience genuine local enjoymentExperience and enjoy our region. We value quality, naturalness and sustainability, we place our trust in longstanding regional suppliers. Salt water pool and sauna theme parkSalt water pool and sauna theme world Dive in and relax: here everything bubbles, steams and fizzles. Salt CavesSalt caves Rejuvenating like a day at the seaside! Wellness & BeautyWellness & Beauty Leave your worries behind ... Feel good, recharge your batteries! Technology / Equipment / WLANTechnical equipment / WLAN Concentrate on your target. We will do the rest. Conference EnquiriesConference enquiries What can we do for you? Supporting programmeSupporting programme First work, then fun! 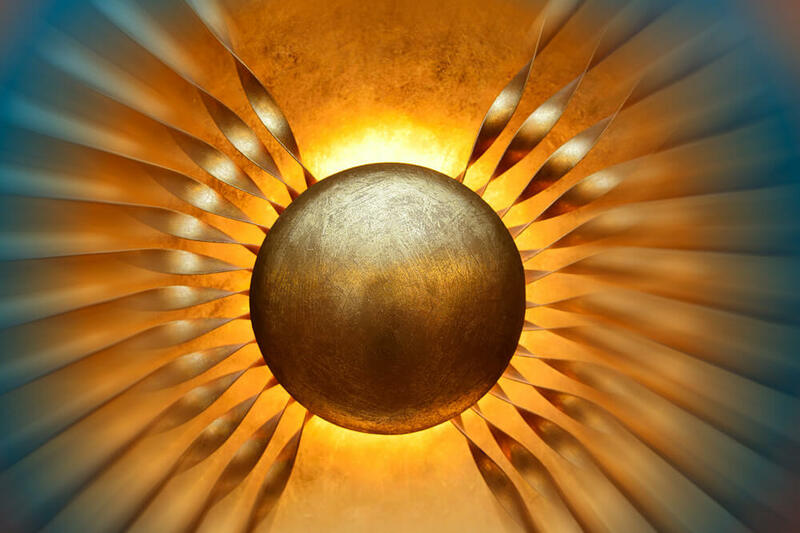 ContactContact We look forward to hearing from you! 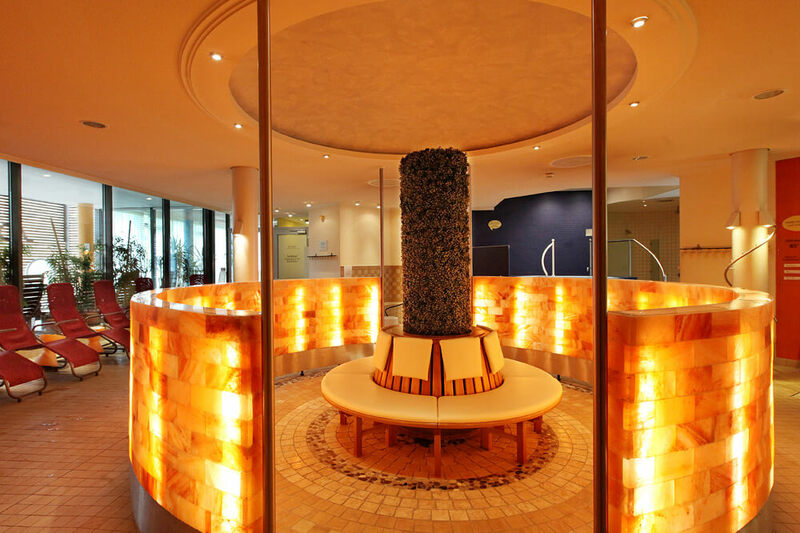 Health and wellbeing, relaxation, beauty even... many people swear by the positive effects of the Haller salt water – and we are sitting at its source! Mother Nature has literally placed these medicinal spring waters at our feet, our greatest treasure. The wellness oasis, with its 2500 m² of salt water pool and sauna theme park, is open to anyone who wants to do something for his health. About ten years ago, the Ringhotel Hohenlohe was one of the first houses in the region to be awarded the quality seal “Wellness Stars Baden-Württemberg”. The successful certification in the four star category has since then been both an incentive and a commitment for us. 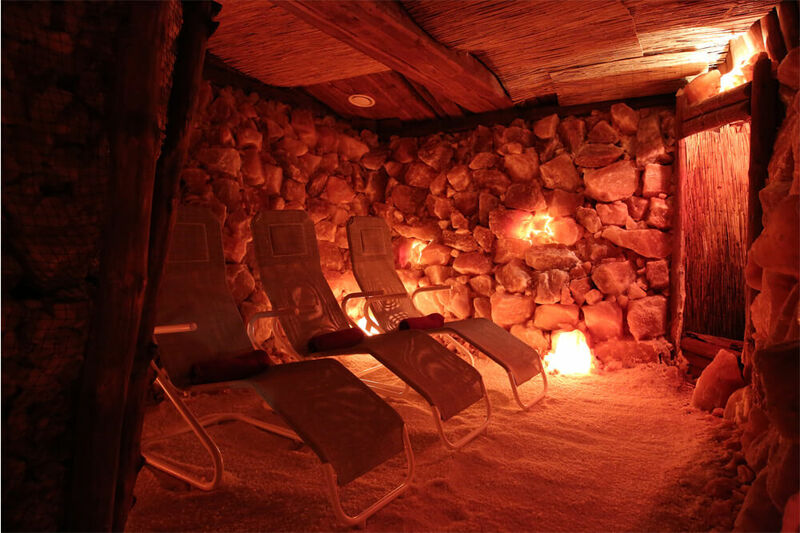 It inspired us to build the salt caves, and encouraged us to extend the beauty, Spa and wellness department with its Physiowell practice. Dip into the medicinal waves of the salt water pool and experience directly the beneficial effect of this natural brine. In the pool, our Haller brine has a salt content of 3.5 to 4 %, with a treasure trove of minerals. It makes your skin velvety soft, moisturizes it, boosts your immune system, stimulates your metabolism, is good for your chest, your joints, bones and nerves. 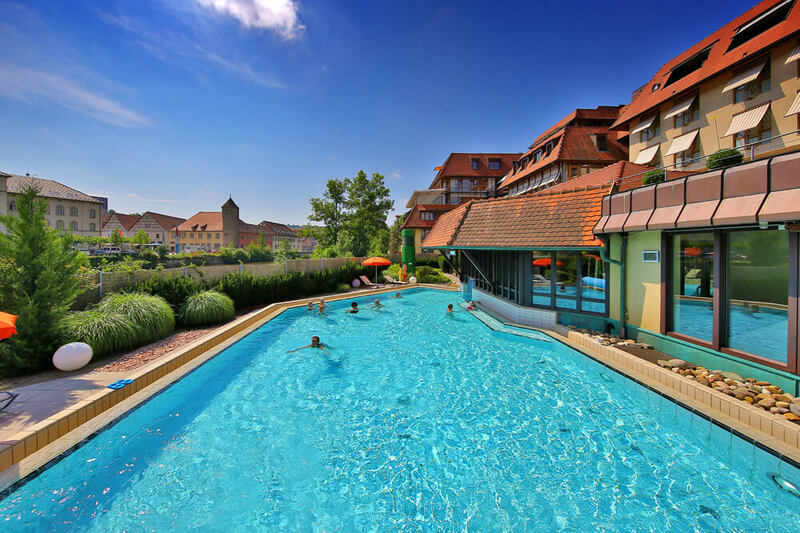 Three indoor pools, a Kneippness pool and the outdoor waterworld (in the sunny garden with its barefoot path provide a wide range of possible options. One of the special attractions of the pool, besides the swaying dance on the waves of the air bubble bench in the Vital round pool (35 ° C) and coming into contact with the super massage jets in the sitting whirlpool (34 ° C), is bathing to underwater music in the “sound and movement” pool (32 ° C). At 10 a.m., midday and 2 p.m. from Tuesday to Friday there is – free of charge – a water gymnastics course under professional supervision which every guest can take part in. You can get mineral water, healthy, sugar-free natural fruit juice, milk drinks, muesli, fruit, raw fruit and , tea and cake at the Vitabar on the ground floor. 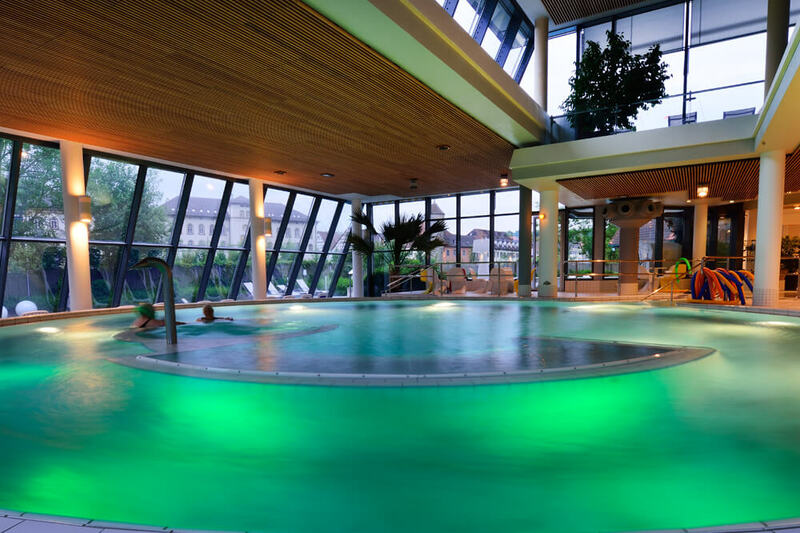 The Vitabar can be reached either from the entrance area, or from the indoor swimming pool. 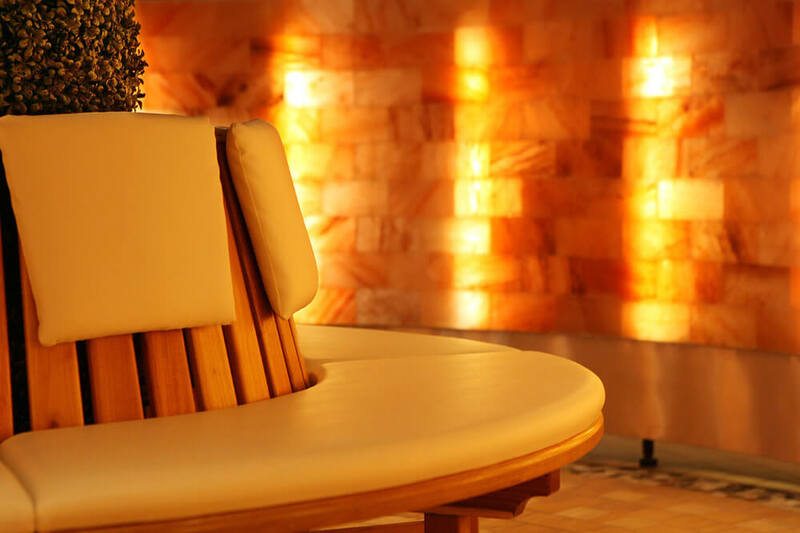 To let off steam, we recommend a visit to the sauna fun world. Here, spread over two floors, eight different fragrance and sweat rooms, including a cold dip pool, keep boredom at bay! On the first floor, a little decorative roundabout made from Himalaya salt rocks considerably improves the air quality, as do the illuminated walls made of Pakistan salt tiles. There is free herbal tea in the tea lounge with its water bar, and you can purchase light snacks and fruit. 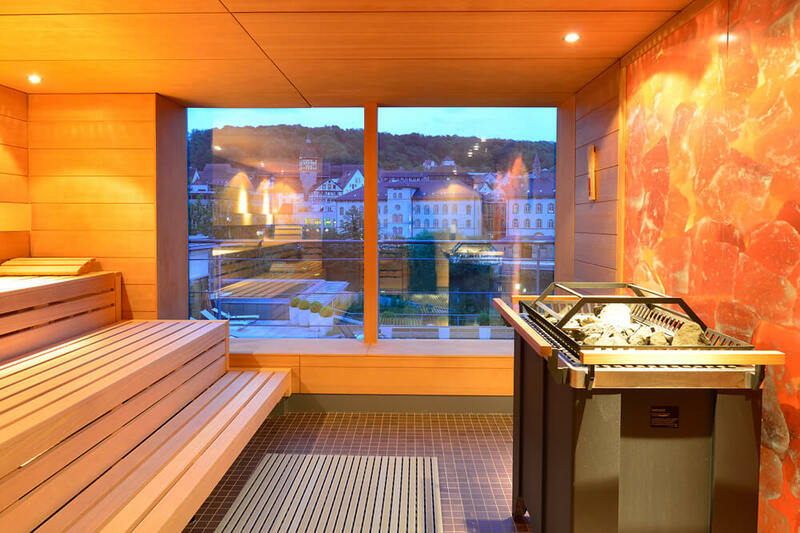 One very popular feature is the comfortable Panorama Sauna, under the roof, with a clear view of the Kocher area and the Old Town. Here you can relax together (Fridays to Mondays) or separately. The ladies are on their own on Tuesdays and Wednesdays, and beauty infusions and peelings are extremely popular. Thursday is reserved for the men. And afterwards? Dressed warmly, you can take deep breaths and gather new strength in the “Room of Silence”, in the fresh air garden on the roof or on the open-air terrace. The visitor is greeted by soft music. 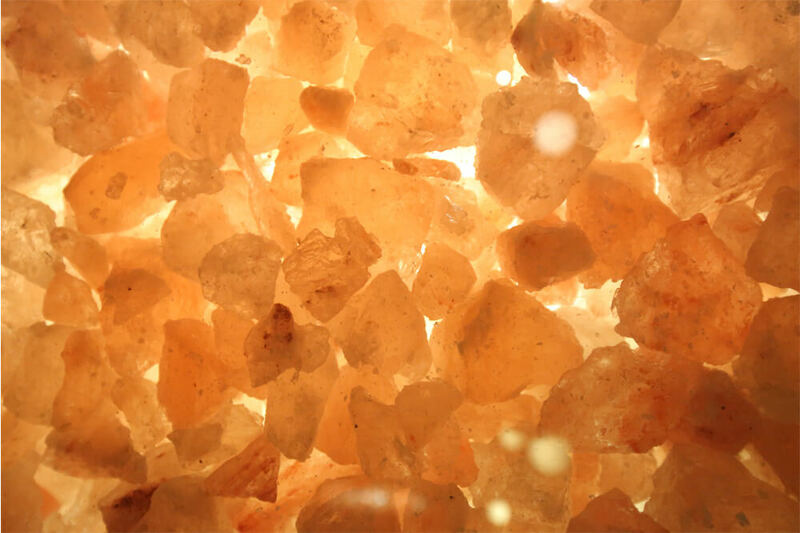 Walls and ceiling are bathed in the warm light of the salt lamps. The temperature is a pleasant 22 ° to 24 °, with about 45 % humidity. Salt from the Dead Sea and Bochneris Salt cover the floor, stone blocks made of Himalaya salt are piled on top of each other on the walls. A total of 60 tons of pure natural salt, spread over approximately 120 m°, provide a treasure trove of valuable mineral substances. With every breath, the visitor inhales these mineral substances, and, wrapped in a warm blanket, can relax and recuperate for three quarters of an hour. The beneficial effect of this bacteria-free, ionized saline air can, if used on a regular basis, reduce many ailments, especially in the case of bronchitis, allergies of skin complaints. 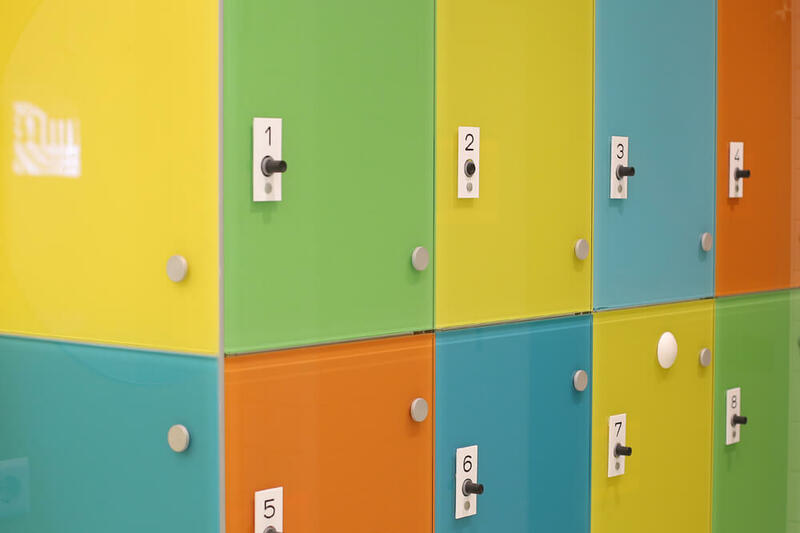 The communal cave, with its salt water fountain and graduation works (18 seats) has been increased by a family cave (8 seats), with a play area and salt castle, in order to help children with neurodermatitis or asthma. You can visit the salt caves in normal clothing and wearing shoes. 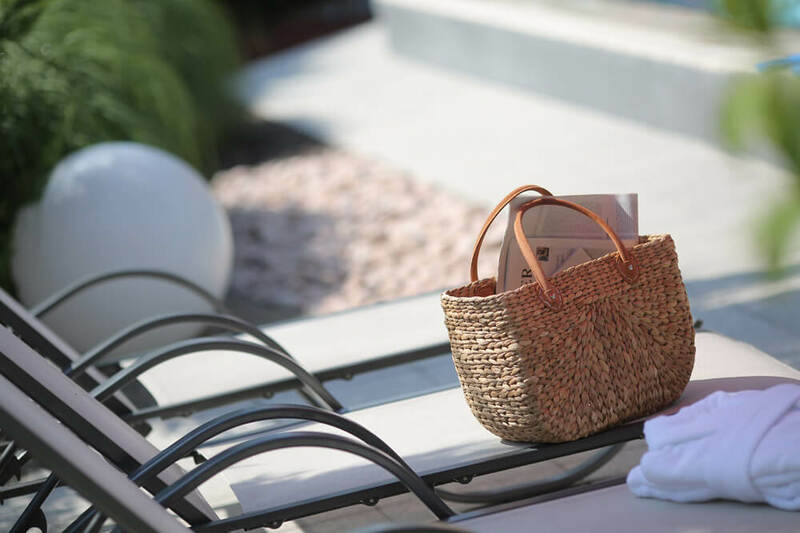 For pool guests, we recommend dry swimwear and a bathrobe. Completely tense, once again? 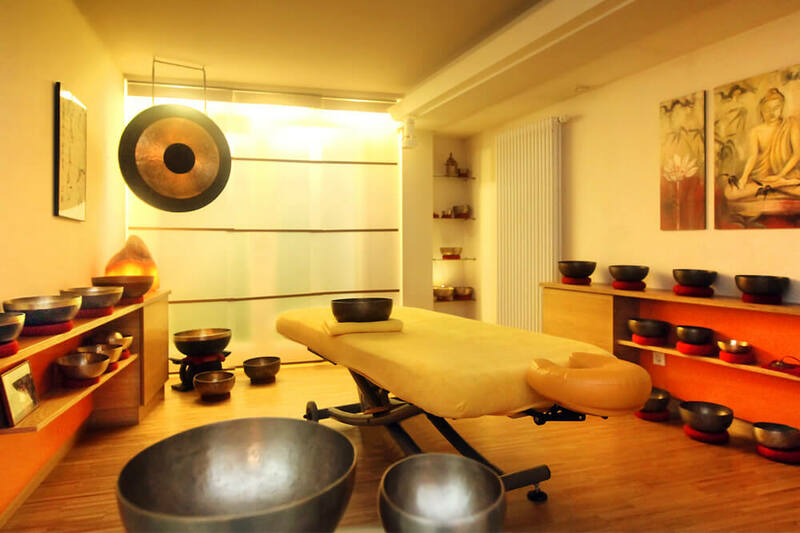 You are in the best hands in our "Physiowell Praxis", which also provides classical massage as well as a whole range of wellness treatments. Here sensuous pleasure is in the foreground. Honey and ginger, aromatic oils and hot stones gently caress your body and soul. 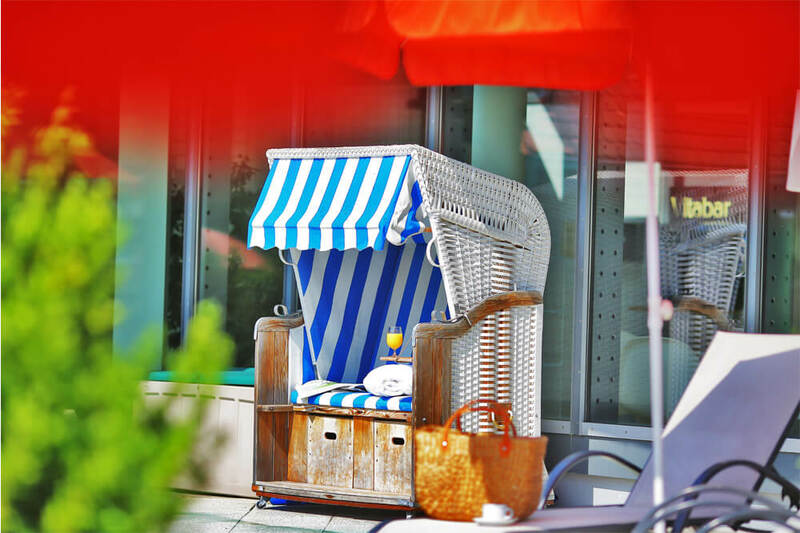 Enjoy some time out on the deliciously warm water bed of the floating lounger on our "Wellness Insel", wrapped in a soothing body pack. Perhaps you might enjoy a facial treatment with THALGO maritime cosmetic products or an East Asian herbal stamp massage? If you would like any wellness treatment it is advisable to book early so that we can make sure you get the appointment you wish for. For appointments please ring: +49 791 7587-0 or use our contact form. Functional training/targeted strength and stamina training, or running/workout with Personal Trainer Rajab Hamisi (B-licence), using for example the cardio and exercise machines in the gym. Or in the open air, jogging/Nordic walking. A training unit per person is about 45 minutes of sport and – where necessary – 15 minutes chat before and after. Price upon request. Leave your car behind, get onto a bike and get to know the beautiful Hohenloher Land – with or without “built-in tailwind”! No problem! Set off through the vineyards, meadows and woods to visit interesting destinations. 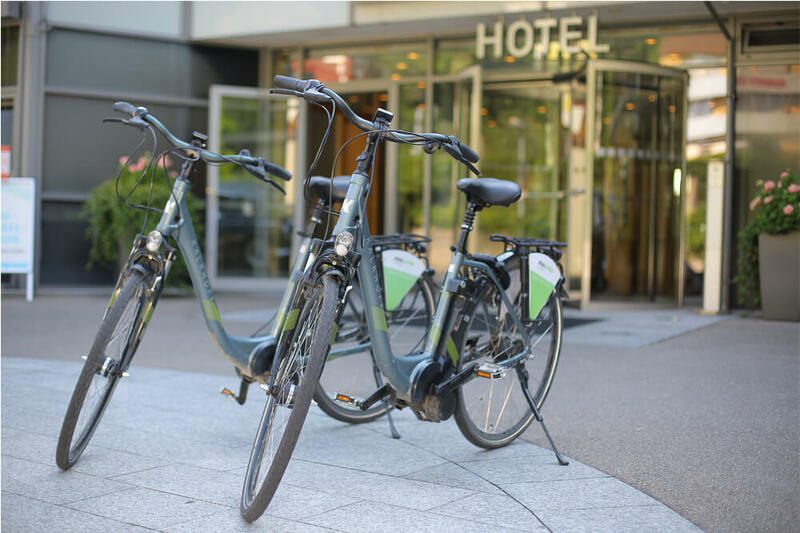 The Kocher-Jagst cycle path, 328 km long, runs through the Neckar valley, the Hohenloher Land and the Schwäbische Alb directly below our hotel. If you prefer to do your fitness training in the open air you can set off directly from the hotel. We have two suggestions for a jogging run, and tested them ourselves. The running map, in a handy pocket size, is available at the hotel reception. And if you would rather walk, we can lend you suitable Nordic Walking poles. 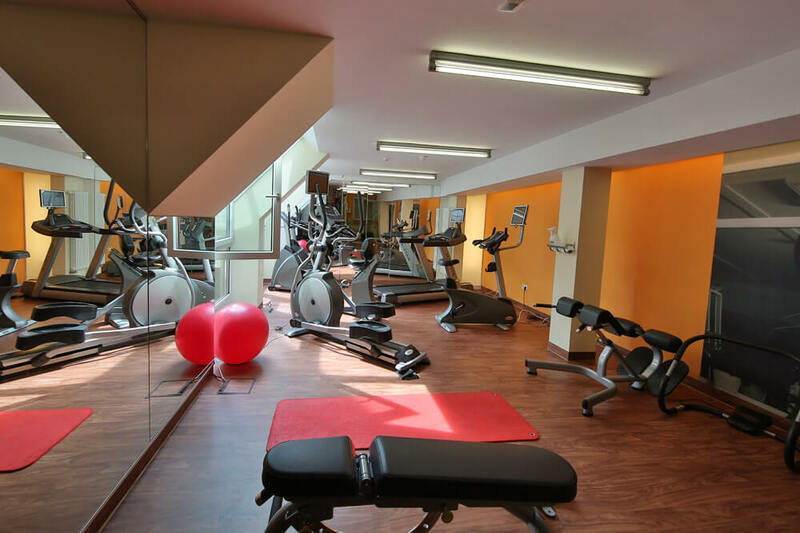 With a lot of daylight, high mirrors and professional MATRIX cardio and exercise machines, our gym is the ideal place for effective stamina and strength training. All cardio machines (treadmill, fitness stepper, bicycle ergometer 45° and cross trainer) have an integrated flat-screen and headphone socket. 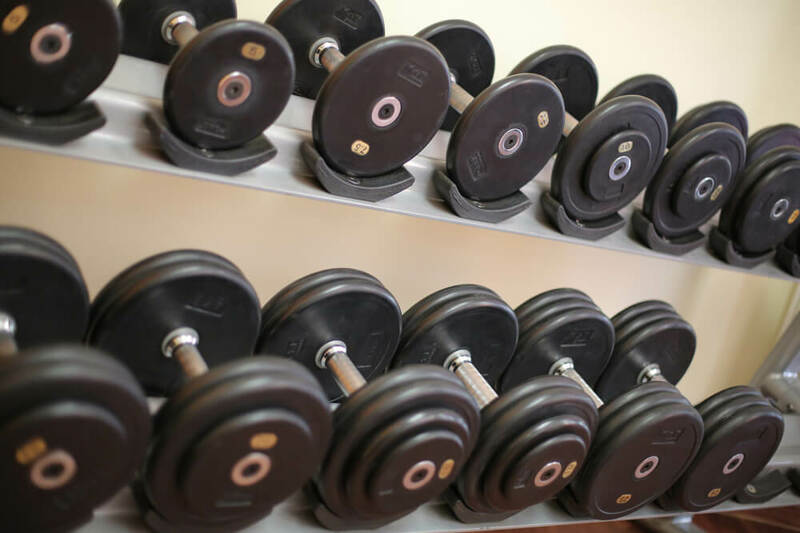 The gym is open from 6 a.m. until midnight, and can be used by hotel guests free of charge.